A home should be a place where, when you walk in the door you get a sense of place. Everything smells just right, there's a bowl for your keys and a spot for your shoes. It's all perfectly lined up for the stripe tease to the bedroom after a long day. Once the comfy pants are on, it's time for a cup of tea and the sinking into the comfy couch cushions. When it's time for bed, you head to your room and snuggle into your comfy mattress and glorious blankets. You get a deep sleep and wake up to the sound of chirping, stretching it all out and feeling amazing. But what if... when you walk in the door and you don't get that feeling anymore? The place has become too small. Where the fridge is too loud and the girl above you does laundry at one in the morning. It's been four wonderful years in this place but now enough is enough. I am not unhappy saying goodbye to this chapter of our lives. I am looking forward to the future. However I want to remember this home, even with it's ups and downs, it has been good to us. We bought my favorite piece of furniture, our bench for the patio!! It went directly across from my feet here. Had my Mom and two sisters came over for a sleepover! The home we made many pies in, including but not limited to a lovely Cherry Pie. That had Kevin hand pitting cherries for a good hour. We then forgot the left over cherries that we didn't use in the pie and they went bad. The we got flooded, then the city flooded, then we got evacuated! We've also had ants and other fun bugs... and also another flooding, just us this time not the whole city! We hosted a Gingerbread party!! 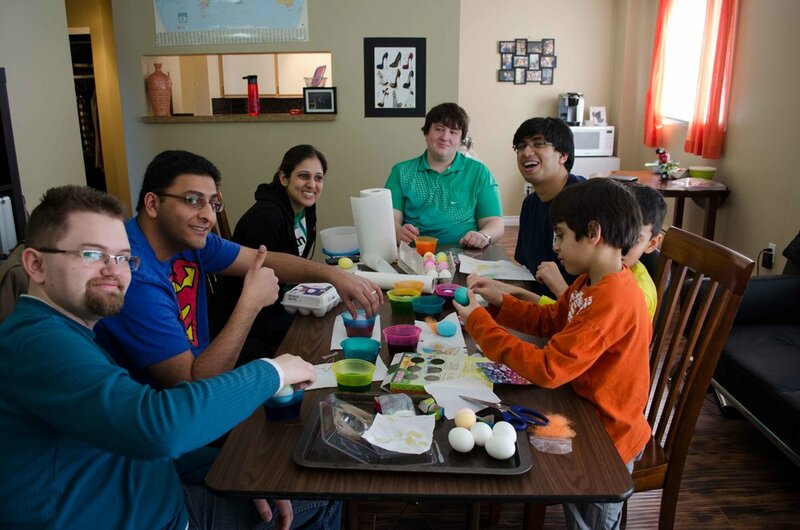 We hosted an Egg Decorating Party! And it was everyone's first time decorating one! This is the home we came to, to call all our friends and family to announce our engagement! I went wedding dressing shopping, we got engagement photos done and I spent too many hours making wedding bouquets!! We hosted many dinners here, my favorite was Thanksgiving! But I will miss the college boys coming over and eating everything I make! This is the home where I planned our wedding and where the boys got ready on the day of. We officially moved out on Friday! It's been a crazy week, with allot of landlord issues. But I am so excited to figure out our next steps and make a home somewhere else!